Explore the history of the Church of the Brethren, Quakers, and other historic peace churches and their work for pacifism and non-resistance with this month’s library display of examples from the Hess Archives Peace Pamphlet Collection. 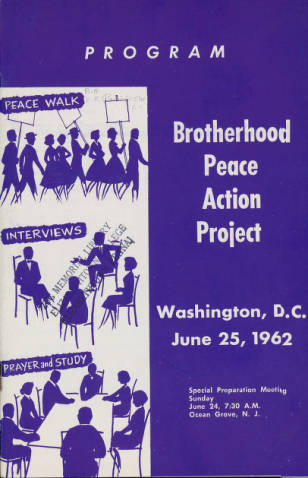 Part of the collection is this program for the Brotherhood Peace Action Project, which was organized by the Brethren Service Commission, the General Brotherhood Board, and the Church of the Brethren. The event took place in Washington, D.C. on June 25, 1962. With materials dating from 1775 to the 1970s, the pamphlets highlight the Biblical basis of peace, alternatives to war, the experiences of conscientious objectors, and other topics on non-violence. As an accompaniment to the display, you can search and browse over 30 of the pamphlets in our digital collections. Scanned and described in 2008 with funding from a Federal Library Services and Technology Act (LSTA) grant administered by the Office of Commonwealth Libraries, the Peace Pamphlet Collection is just one of many digital collections available through the High Library and Hess Archives website. Categories: Archives, Digital Collections | Tags: Anabaptist and Pietist studies, archives, digital collections, displays | Permalink.